This Spanish-inspired appetizer will be the hit of your party. When you marinate shrimp in lemon juice, the avid from the lemon can actually “cook” the shrimp and change its texture overtime. By using only lemon zest here, you can let the shrimp marinate longer, which results in better flavor. These skewers are pretty served warm on a tray with grilled bread, Spanish olives, and Manchego cheese. Whisk together the vinegar and next 8 ingredients in a large bowl. Add the shrimp, tossing to coat. Cover and chill 4 hours. Drain the shrimp from the marinade, discarding marinade, and season with salt and pepper. Grill the shrimp 3 minutes per side or just until done. Slice the chorizo in half lengthwise, and then slice into ¼ – inch thick slices. 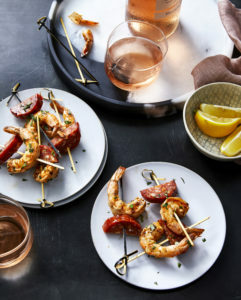 To assemble, skewer a chorizo slice followed by a grilled shrimp. Serve immediately. Get your copy of Martina’s Kitchen Mix!